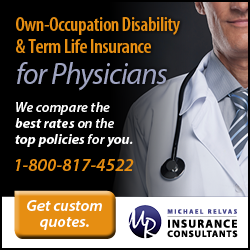 Most doctors do not have to go through the process of picking out their own Medical Malpractice Liability Insurance (MPLI) since it is almost always provided by the group/hospital employing you. Unless you set up your own practice or, like in my case, work as an Independent Contractor, you may not have first-hand information of how to go about purchasing MPLI. Since I am planning to moonlight for other practices in town, I got my own malpractice insurance to give me the most flexibility to work with different groups. This is an account of what I learned going through the process recently. The medical malpractice insurance industry tends to go through cycles. In the early 1970s, several private underwriters left the segment due to increasing payouts and low premiums. This led to an availability crisis. In response to this dearth of availability, physicians across the nation turned to their state Professional Associations and formed their own malpractice insurance companies, jointly owned by them. These originally physician-owned MLPI companies now control half the market-share. Examples include The Doctors Company (TDC) from CA- that operates nationwide and MAGMutual from Georgia, which operates in 10 states of the SouthEast. These companies are mutually owned by policyholders and often return profits back to them in the form of dividends or rate cuts. For this reason, they are called “participating” carriers. As examples, in 2016 MAGMutual returned $25M to policyholders in the form of about 10-12% reduction in premiums (based on how long a policyholder has been with the company) and in 2015 TDC returned $28M in dividends to policyholders. There was another crisis in the late 1990’s, leading to premiums peaking in 2002. Since then, they have gradually fallen and largely remained steady over the last decade or so. Coupled with the fact that the number of claims filed has been decreasing, premiums have fallen 20% since 2006. Since 1991, Medical Liability Monitor has been publishing an annual rate survey for 3 specialties: Int Med, Gen surgery and Ob/Gyn (representing the broad spectrum of rates across specialties). Click here to see historical rates by state and specialty. States with effective tort reform, such as caps on non-economic damages, have seen significant decrease in litigation followed by fall in average premiums. Some of these states are CA, CO, KS, TX, Alaska, NC and the Dakotas. Indiana has a process for pre-litigation screening by a panel, apart from a cap on total damages. Most of these states have seen among the lowest malpractice payouts per capita. Interestingly, many of these state legislatures have a physician in office. At the other end of the spectrum are Illinois and a bunch of states in the North East- DC, PA, NY, NJ and Delaware. These states have no effective tort reform and see some of the highest malpractice payouts per capita. Here, litigation is commonplace and premiums are sky-high, sometimes more than six figures annually for high risk specialties such as surgery and OB. Here is a good summary of Malpractice Laws by state. Malpractice insurers have had different experiences defending different specialties. As such, they develop a proficiency for better defending some specialties than others. It is important to research which carriers have had more success in defending claims in your specialty before you choose a carrier. This also results in you obtaining better premium rates within the context of your geographical region. It is really important to choose the right insurer- one that has been around a good while, has developed a good reputation and is financially rock stable. With regard to financial strength, the principal rating system of the insurance world is A.M. Best. I recommend you stay with a company with at least an A or better (A+, A++) rating unless you have a specific reason for your decision. Note that the first 5 companies write more than half the total volume according to annual statement data from SNL Financial as of 4/15/16. If you get sued, that last thing you would want is to be defended by an attorney sitting halfway across the country from you. You want a really good, local lawyer by your side. Most MPLI companies do have a local network of attorneys but the density of the network will depend on how much they are invested in your state. For example, if there is a CA-based insurer in FL, they may not have as rich a network of defense attorneys and other support staff based locally in each of the bigger cities in Florida than a company based in the Southeast. In that respect, MPLI is not just a commodity where price is the only consideration. Some insurance companies that are licensed and registered to the Dept to Insurance in your state are known “admitted” carriers for your state. They are more tightly regulated and also protected to some extent from insolvency by a “guarantee fund” (kind of FDIC for banks). Some doctors may have a hard time finding insurance in this market with strict underwriting rules if they have had difficult professional or personal issues- negative outcomes, disciplinary action, performing extremely high-risk procedures (like bariatric surgery, when it first evolved) or alcohol or drug dependence. They depend upon a secondary market of insurers- “non-admitted” or “surplus line” carriers. They are thus known because they are not regulated to the same extent nor covered by the state’s guarantee fund. Premiums in this market run significantly higher, often up to 30-50% more than usual and also carry hefty deductibles in the range of $5-10k per claim. Sometimes, your broker may be able to negotiate that the deductible go toward payout. Now this alternate market is sometimes also available to regular, non-high risk providers, thereby providing them more choices, which helps to bring down costs. Be sure to pay attention to company ratings among these carriers, too. It is possible for an informed physician to shop for malpractice insurance on her own. However, it makes sense to go with a knowledgeable and scrupulous independent broker who is able to get you quotes from multiple carriers (as opposed to an agent who works exclusively with one insurance company). The broker is reimbursed by commission from the insurance carriers- so they do not directly charge you for their services. This carries with it the usual conflict of interest inherent in a commission-based model of reimbursement. However, the fee-based model may not save you money in this situation because insurers will charge you the same annual rate and you will get stuck also having to pay a fee to your broker. In Part 2 we’ll continue with this series by looking at my personal experience buying. In the meantime, have you shopped for malpractice insurance? How did you decide on a company? Comment below! Can you do a post about malpractice insurance for residents who moonlight? Moonlighting is extremely common and we get literally zero training in malpractice insurance. I think you’d look for the same things when you buy malpractice insurance for moonlighting purposes. These are some of the core characteristics you want to make sure your policy has. Perfect timing for this post-as I was just reviewing a potential job with ins from a “surplus line carrier”-did not know what that was but did not like the fact that it was not protected by the state’s guarantee fund-so this clarifies it a lot, I guess the surplus line carrier insurance is cheaper for them? It is a claims policy and then also surplus line carrier–it makes it too risky…thoughts? I have MedPro and one benefit they have that I like is that it also covers state medical board requests and actions (within limits). I don’t believe most malpractice policies cover these. These can be as bad or worse than getting sued. in my state the board has to check out any complaint no matter how frivolous and it’s really better to have an experienced attorney assisting. Policies with most large carriers do have coverage for state board actions and sanctions, disciplinary hearings, etc. It should be outlined in the policy details if you read it carefully. This is generally up to a certain $ amount- 50k-100k annually- which likely differs between carriers and with your policy size. 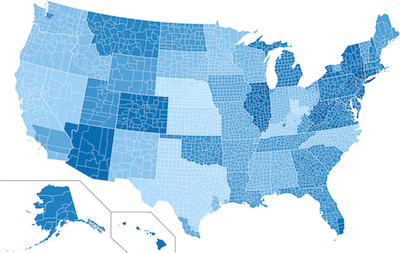 Why is Colorado shown in dark blue, but listed as one of the best states? Great question! As it turns out, premiums mostly, but not always, correlate with tort reform in existence in a particular state. The insurance industry says that for such areas, their losses/gains were not significantly altered by the reform in existence in the area. This is likely impacted by several factors, one example being a very litigious society/culture in the area. This then brings up the discussion on what kind of tort reform works out to have the most meaning/impact. I’m an independent contractor in CA working for two groups. One is a hospital-based group with 2 partners, and I’m covered under their policy as locums. 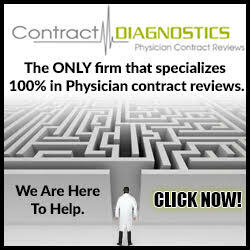 The other group is a small private practice group that contracts with multiple hospitals and imaging centers. The group has its own policy but everyone also has individual policies. I’m wondering if it’s the norm for people to have individual policies on top of a group policy. And regardless of the norm, is my status as an independent contractor enough reason for me to have my own policy? Am I more exposed as an IC? That’s an odd set-up. I bet the “group policy” covers the imaging centers, not the docs. i.e. there’s a contrast reaction and both the imaging center and the doc on duty at the time are sued. Each has their own policy to cover the defense and any payments. You need a policy that covers what you’re doing. But being an IC isn’t particularly worse. I’ve been in practice for about 5 years. I live in the Northeast in a litiginous state and have recently settled a claim and it will go on the NPDB. Does just one settled claim make it difficult to get hospital credentialing, new state medical licenses, keeping malpractice insurance, or obtaining future jobs? I hope that just like car accidents, one accident doesn’t make you bad but instead you are only bad if you are making multiple settlements/verdicts in short periods of time. Obviously I do understand that even one settlement is worse than none. But my question is more is this going to be a big problem going forward? Also at what point are you considered a high-risk physician my malpractice insurance carriers? Is it just one malpractice settlement/verdict against you or does it take multiple? While I know the settlement will stay in perpetuity in the NPDB, do at some point credentialling boards and insurance carriers have that case “expire” from their considerations (for example my car insurance doesn’t consider accidents > 3 years old)? Obviously I do understand that even one settlement is worse than none. But my question is more is this going to be a big problem going forward? Also at what point are you considered a high-risk physician BY* malpractice insurance carriers? Is it just one malpractice settlement/verdict against you or does it take multiple? While I know the settlement will stay in perpetuity in the NPDB, do at some point credentialling boards and insurance carriers have that case “expire” from their considerations (for example my car insurance doesn’t consider accidents > 3 years old)? No, one is fine after 5 years. I saw all the credentialed providers come through my hospital and nobody ever batted an eye at one. That said, I was surprised how many docs who had been practicing for a long time had none. No, nothing ever expires. If you can keep it to one suit a decade, I think you’re fine. If you’ve had 8 by year 10, I think you’ve got a problem, even if you’re a neurosurgeon. I’m currently in training and wanting to moonlight for a locum that provides medical malpractice insurance of $1 million per incident and $3 million in the aggregate. Would you say I still need to get my own? No. But make sure they provide the tail if it is a claims made policy. This is a really interesting post. I think it would also be great to see a breakdown by state, like which companies receive the most direct written premium from each state. That would eliminate some of the bias of companies simply collecting more revenue because of the states in which they operate. I had a question regarding the tail coverage. I switched jobs in July 2017. Due to being a regular visitor of WCI blogs and podcasts, I was aware at that point to inquire about whether my policy was claims based vs occurrence based (I should have known better at the time of signing the contract). It turns out that my contract mentioned that the policy could be either occurrence based or claims based, however, if the employer chooses to have claims based policy in place, the employer will be responsible for arranging the tail coverage for the employee when he leaves. So that all sounded good. At the time of leaving the job, I reached out to the person in charge and requested proof of paid tail coverage for my claims based policy. Below is the response I got. “The medical malpractice coverage afforded to Dr **** (myself) is on a claims-made basis, and the limits were shared amongst all employees, employed physicians, and all entities of **** (the healthcare system I was employed by). As this is a “shared limit” program we cannot tail out the policy every time an employee leaves. The coverage remains in place and is renewed annually. In lieu of a tail, the formerly employed physicians are continuously covered for any future claims made against them for any acts or errors related to the time of their employment, or back to their retro date on coverage. The “reporting rights” letter is from the insurer and it clearly states he can report future claims for incidents that occurred during his employment. Does this sound legit? Am I covered or I have reasons to worry and dig further deep in to this? Hi. Thank you for this great post. It’s now 2019. Do you know if the ratings are the same? I’m anesthesia, leaving a group in CA with The Doctors Company (who are pricey) and looking to move to Wisconsin, if this changes anything. I’ve gotten competitive quotes from Medical Protective and trying to decide if it is worth the financial savings. Any advice? Is $1M/$3M usually enough? or is $2M/$5M better. For what it’s worth, I’ve actually been insured by both of those companies within the last 5 years. We’re not with someone else. Every time we change, we get lower insurance premiums. Buy however much other docs in your specialty and area carry. For EM in Utah, that’s $1M/$3M. You want enough to pay for a robust defense, but not enough that you stand out as a deep pockets target.